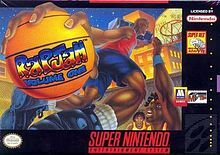 RapJam: Volume One for Super Nintendo has rappers available to play basketball. Playable are Warren G, Queen Latifah, Naughty By Nature, LL Cool J., Yo-Yo, Public Enemy, House of Pain and Coolio. It's one-on-one street ball with no refs, no rules.